The video that was originally on this page featured Aneka (Scottish folk music singer Mary Sandeman) performing Japanese Boy on Top Of The Pops (UK), with Legs & Co doing the dancing. However, the video has been removed from Youtube, so I have replaced it with a new playlist which includes a rare and rather bizarre-sounding performance which makes Sandeman sound like she's been on the helium - see the second video! The single was a #1 hit for one week in August 1981, and adopted an oriental image, although some critics claimed that the music was more Chinese than Japanese. Indeed, the song failed to become a hit in Japan because of this. Worldwide, the song sold around 5 million copies. Japanese Boy was produced by Neil Ross and written by Bob Heatlie, a Scottish songwriter and producer who created a number of hit songs for Shakin' Stevens including that festive favourite "Merry Christmas Everyone". Creating a follow-up was always going to be a mighty challenge. Do you stick with the same image and limit yourself to an oriental style of music, or create something new? 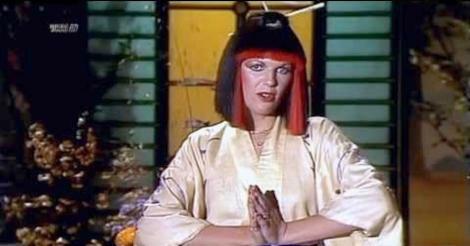 Sandeman chose to keep the same name and Geisha girl image, but release a dull follow-up without the oriental hook, which put a premature end to her music career, in the UK, at least. In 2002, the track featured on Flash FM in the video game Grand Theft Auto: Vice City. 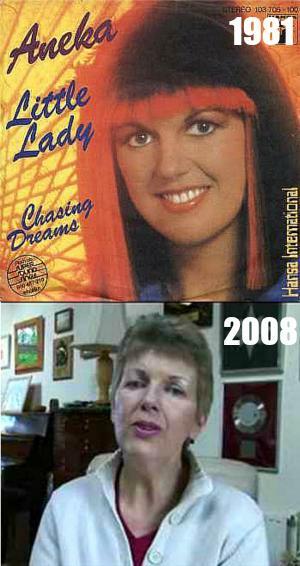 In 2006, Mary Sandeman featured in a documentary on Channel 4 in the UK entitled Bring Back One Hit Wonders. Presented by the infamous Justin lee Collins, Sandeman refused to perform the song again and didn't want to make the trip from her home in Scotland to the London-based studios. A follow-up single Little Lady saw Aneka adopt a slightly modified image, apparently, although she still looks exactly the same to me in the video below. This proved to be a big mistake as the single only crawled to No.50 in the UK singles chart, although it reached No.7 in Austria, No.10 in Germany and No.14 in Sweden. Little Lady featured a very familiar bassline, but there was no distinguished oriental sound and Sandeman just looks uncomfortable miming the song in the performance in the video above. Let's face it, the song was just pants! For the third single, Ooh Shooby Doo Doo Lang, Mary adopted a very different 1930s gangster fashion style. The song had a very catchy, Eurovision style hook, but still failed to become a UK hit. The B-side was suggestively-titled Could It Last a Little Longer? - I wonder what she was referring to? Mary Sandeman gave up singing as a career choice in the 1990s. Now in her 60s, she is a chair person for the Gaelic Language Promotion Trust. She now lives alone and also works as a tour guide around the old town and castle in Stirling, Scotland. Sandeman lost her only brother in a flying accident in 1975. She divorced her husband, Duncan, when she was 38 and had two sons with him. Duncan, now in his 40s, is a full-time piper and younger son Iain, also in his 40s, works as a rope access technician on oil rigs. 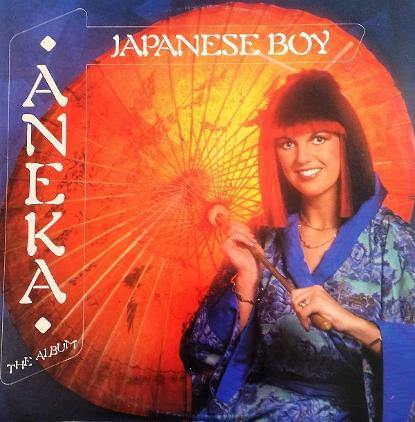 "Aneka - Japanese Boy" by Source. Licensed under Fair use via Wikipedia.